I ended up stopping by three different thrift stores during the month of February. First up, a local Goodwill that is very hit or miss, but typically has great prices. Second, my favorite thrift spot (2nd Avenue) in a not-so-great area of town, and third the pricey thrift store (2nd Avenue) right in the middle of Columbia. I ended up with six great items, but I wanted to remind you that I literally went through each entire store in order to find the *good* stuff. Well, good stuff for me… there were plenty more great items in sizes, styles or fits that didn’t work out for me. Anyways, if you are thinking about trying out thrifting… don’t get discouraged when you see a bunch of crappy stuff. It takes time and patience to find things that you’ll end up loving! 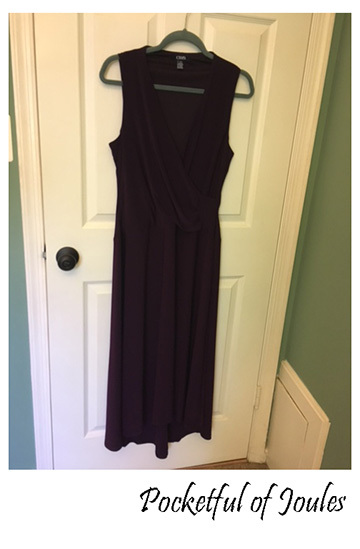 I really like the dark purple Aubergine color of this dress and I picked up because I don’t have many solid dresses in my collection. 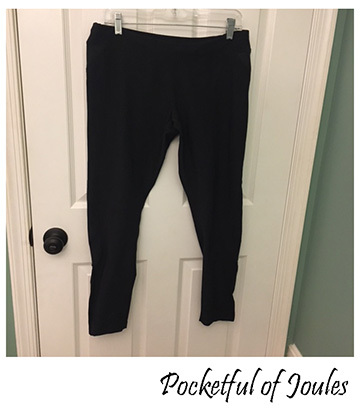 It is currently sitting on my sewing table because I think I’m going to chop the length to knee-length and add a tie-belt with the extra fabric. While it is very pretty in its current design, hemming it shorter will make it more work appropriate for me. I can see me wearing this to work with a pretty embellished sweater and patterned flats. I love a good workout/laze around the house top. 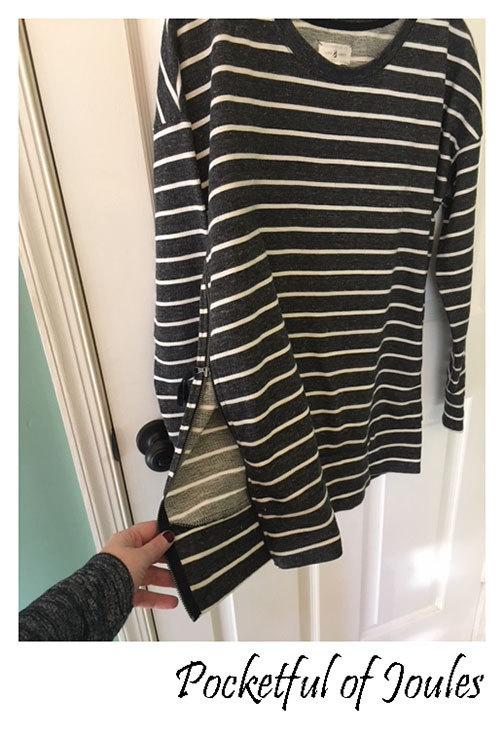 This one is oversized with a high-low hem and has thumb holes! 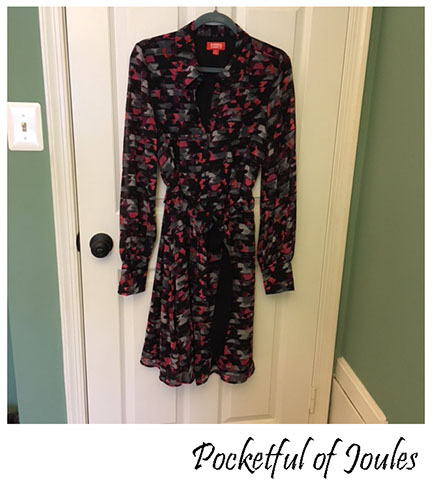 I thought this would be good as a topper on the way to the gym, or for those chilly work-from-home days with leggings. I’ve already worn it twice and I’m sure I will get my money’s worth for the $6 I paid! 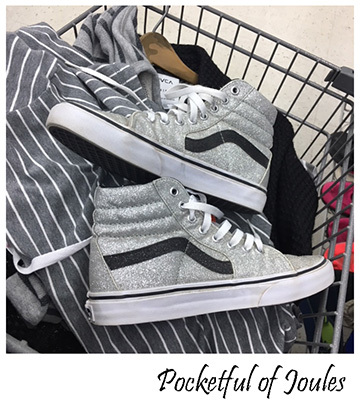 Yeah, they pretty much HAD me at glitter and high tops… the $7 price tag was just the cherry on top. I love fun shoes and these silver glitter Vans are perfect for me. Depending on the brand/style, I wear anywhere from an 8 to a 9… so I was bummed when I saw that these were a 7.5 I tried them on though and even with my warmer socks on they didn’t feel too tight. I figured I’d give them a try and googled some tips on how to stretch sneakers. Only the left one was a bit tight in the toe-box area, so I tried the ‘put four socks on your foot and shove it in there’ method. I also aimed the hair dryer at it a few times throughout the day. Last, I stuck a shoe stretcher in there and left it over the weekend. The stretched just enough and are now perfect. These look so cute with leggings and a comfy top for a casual day. OH my gosh you guys, this is basically the score of the day! I went over to the more expensive thrift store and found these mint condition UGG wedges thrown in with a bunch of cheap plastic boots. 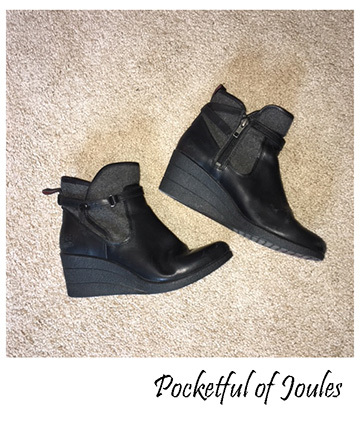 I did a bunch of googling and this style was sold at Nordstrom in 2015 for $180 and a very similar pair is still being sold. This particular thrift store usually prices known brands high, so I wasn’t surprised about the mark-up. 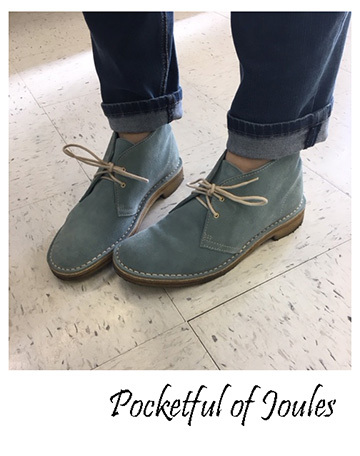 These are my size, comfortable and in perfect condition… so I was quite happy to get them for $25. I wore them to my sister’s bridal shower over the weekend for about 9 hours and they were actually pretty darn comfy! 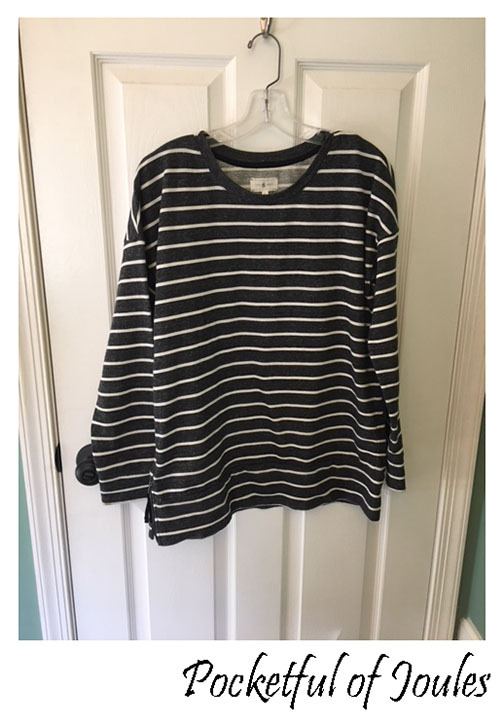 I was looking in the cardigans section for a striped sweater to replace one of my favorites that is starting to look kinda sad. 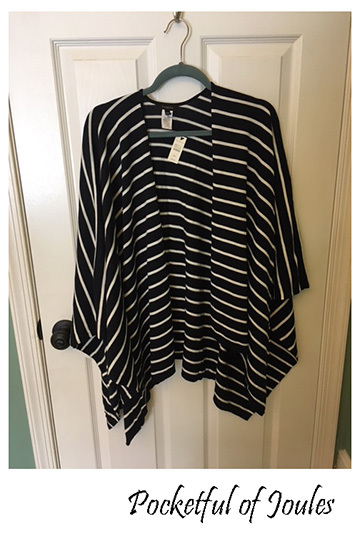 I saw this striped cape and it is a brand-new with $89.50 tags still on it from Talbots. 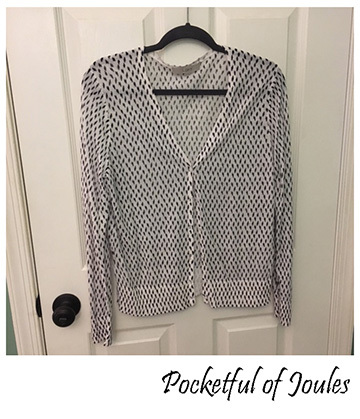 I wear my Causebox cape all the time and this will be a perfect spring option. 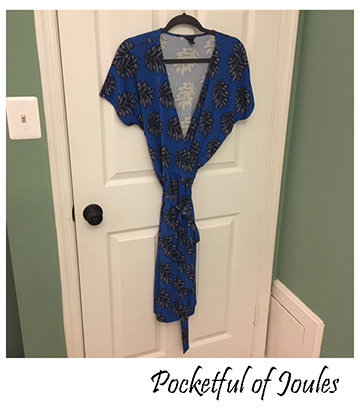 You can see a dressing room pic of this cape and the next dress here (click the little arrow). 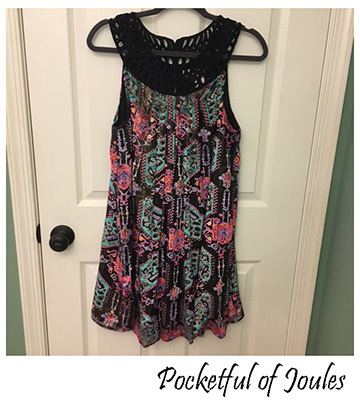 I love the colors in the pattern of this pretty Loft dress. 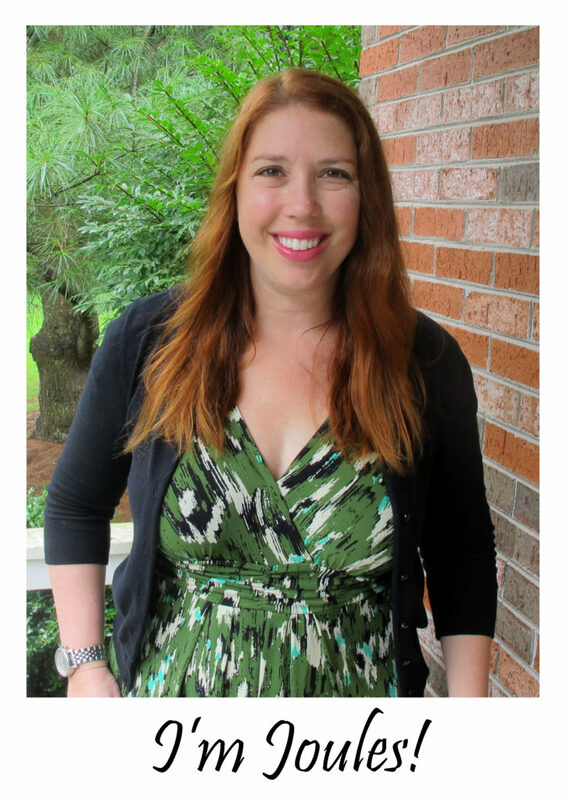 It’s got elbow-length sleeves and a knee-length skirt, which is exactly what I like in a dress for work. 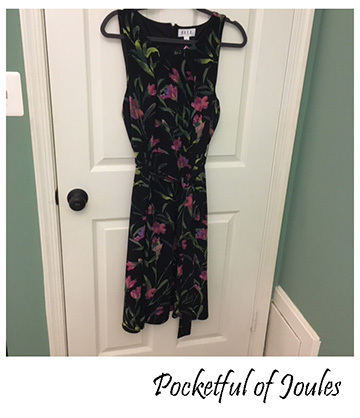 I threw it in the wash immediately (washed in cold and then hung dry) so I could wear it to my sister’s bridal shower over the weekend (see it here). I had a hair appointment this month, so I decided to take the whole day off as a mental health day. Which, to me, means THRIFTING! I had a bunch of other errands to run too, so I was only able to stop at one thrift store and found three great items to bring home with me. Since this month’s ‘haul’ is so small, I decided to do a quick little styling photo for each item. Let me know if you like this in addition to the hanger pics and maybe I’ll start regularly including them in my monthly round-up post. The best I can determine; Charles Gray London is a brand that was sold at Nordstrom and now appears to be rebranded as Helene Berman London. 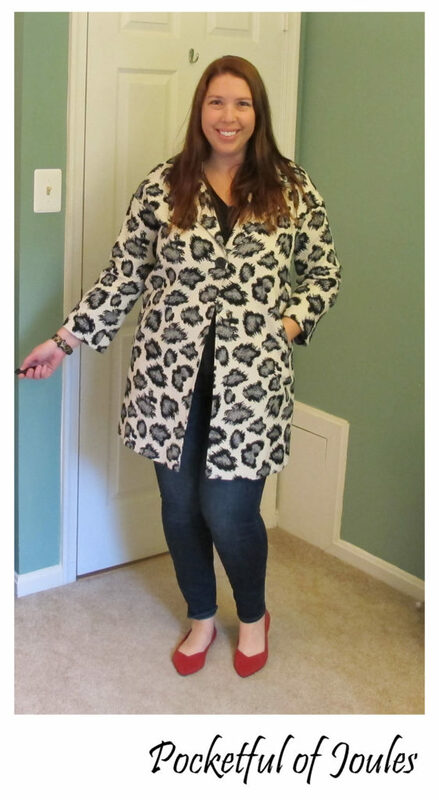 I did find a few Charles Gray London coats on Poshmark and such. But when I searched Helene Berman London, a couple options came up at Anthropologie for $240ish. Of course. 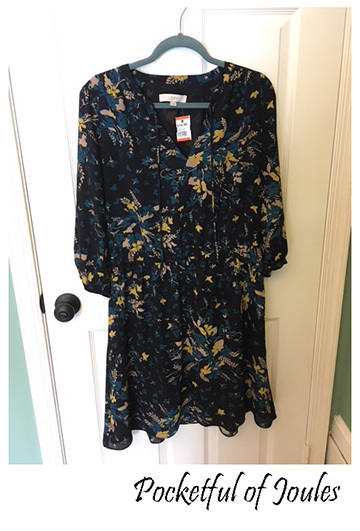 Because I am the girl who can spot an Anthro brand from a mile away at the thrift store! Anywhoo… does it really matter? I mean LOOK at the cute pattern on this coat! I checked the inside seams and it seems brand new. 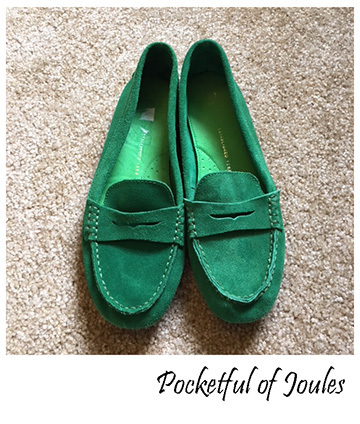 There isn’t a spot on it and the front pockets were actually still sewed shut. I’ll probably just throw this on as a topper in the spring when it gets a little too warm for my current coat. For my styling photo, I just stuck on a black t-shirt, dark jeans and red flats. 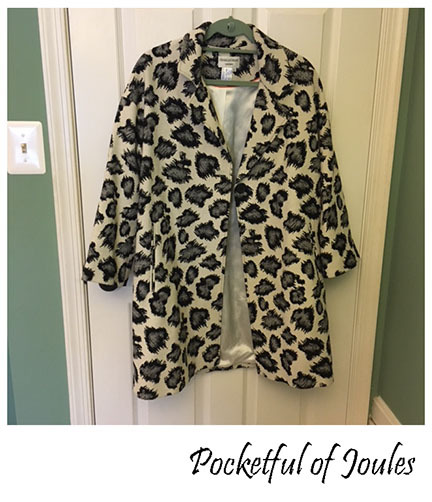 This fun coat makes even a simple look like this one look awfully stylish! To be quite honest, I don’t normally go for those designer compilations with Target. I wanted to love the Toms x Target line and the Lily Pulitzer x Target lines, but the quality was pretty disappointing. I’m not familiar with Kirna Zabete at all, but apparently their collaboration hit Target’s shelves in 2012. I decided to try this on because I really like the pattern and thought the shirtdress design with a cinched waist could be flattering. 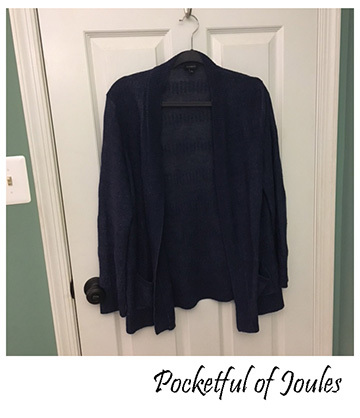 You can see the interesting sleeves in the first photo, but they can certainly be toned down a bit by adding a blazer to the look. I actually wore this outfit (with the blazer) to a work event last week and thought it was comfortable, yet professional looking. 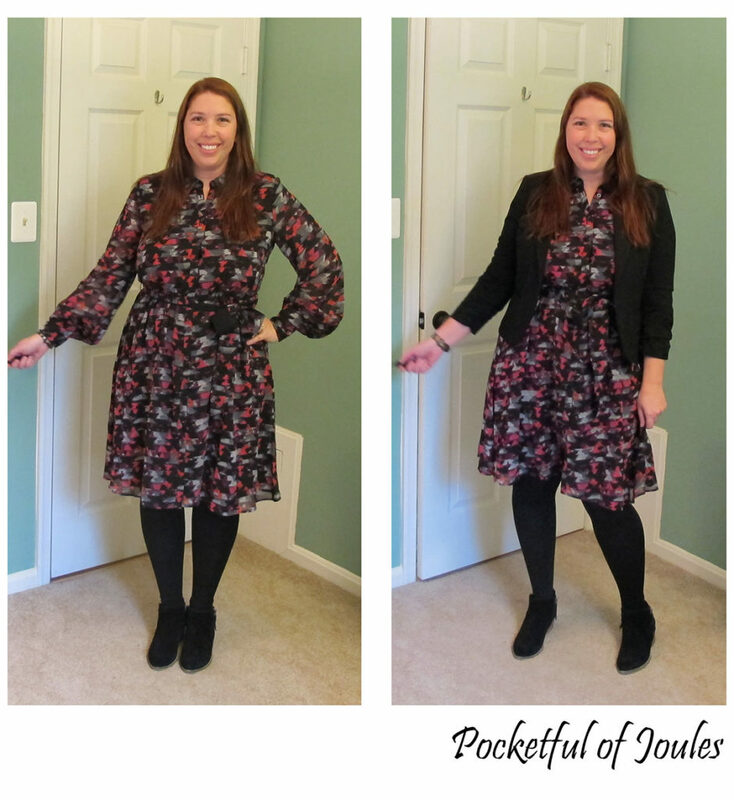 I don’t love the dress with bare legs, but think it looks cute with the black tights and booties… so this one is a winter winner for me. This one is totally outside my comfort zone. I don’t own any sleeveless sweaters, but I have admired them on other people. 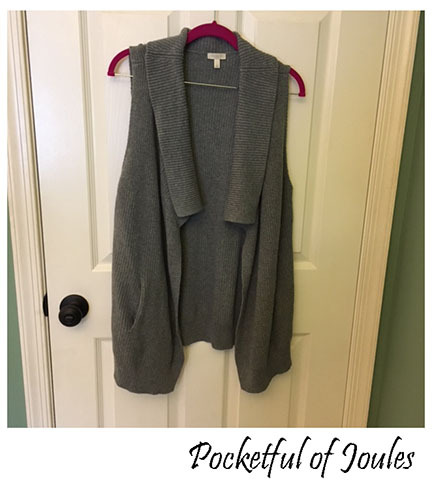 This pretty gray knit sweater has a flowy front and some handy pockets. For $10 it’s not an expensive way to decide if I like the trend. 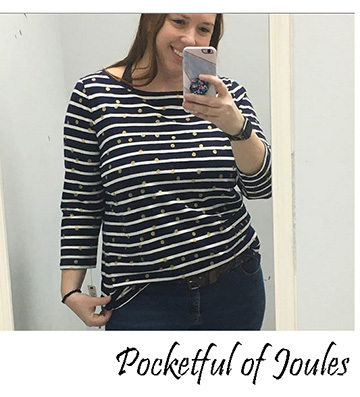 I love this graphic t-shirt, but it is awfully thin so I usually get kind of chilly. 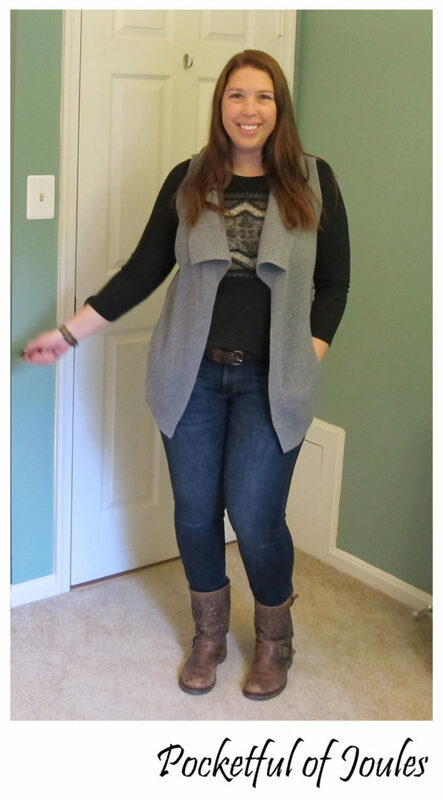 I thought adding the sleeveless vest would be a nice way to keep a little warmer and also add some interest to the outfit. What do you think, is it working for me? 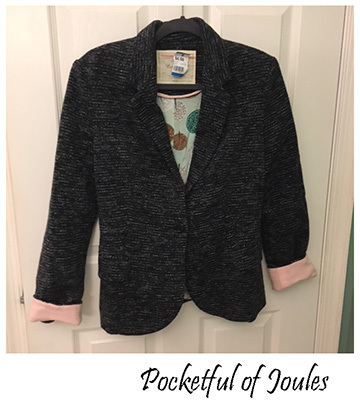 During the month of December, I only had one day to go thrifting… but I made the most of it with THREE different stops! 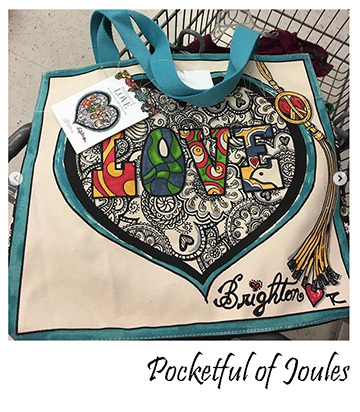 Of course, with thrifting you can sometimes find a dozen awesome items at one store, or absolutely nothing no matter how many stores you visit. I ended up finding just two items… but I’m pretty happy with them! I knew that Lou & Grey is a line carried at Loft, but I didn’t realize they have their own website too. 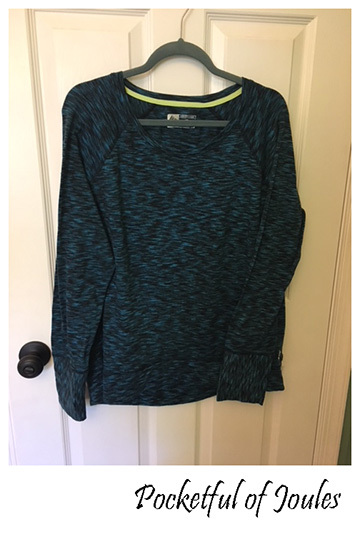 This sweatshirt is a super soft cotton fleecy mix. On their websites, similar sweatshirts sell for around $60. This one is kind of cool because it has a zipper up one side. 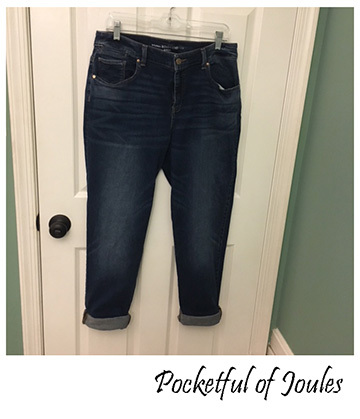 So you can zip it up just a bit to show off a pop of color on a t-shirt. Or a little puff of love handles if you’re into that kind of thing. It was soft, comfy and new for $5, so it obviously had to come home with me for lounging this winter. 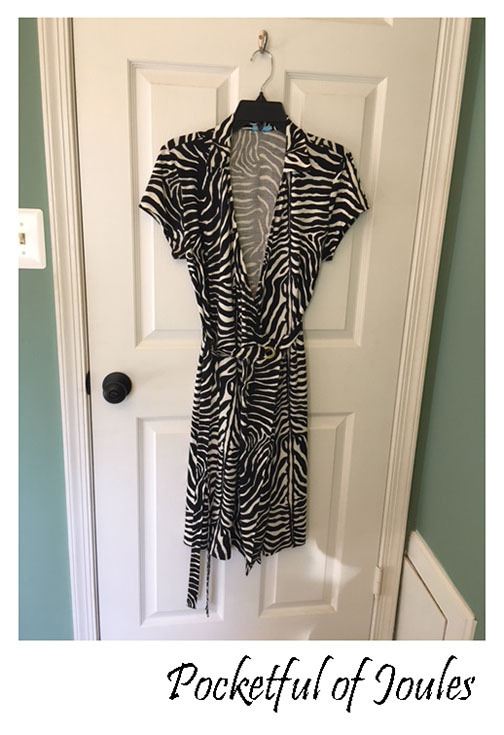 This is a J McLaughlin 100% silk wrap dress with the original tags for $218 still on it. I’m only familiar with the brand because I thrifted a sweater from them last year and did a little research. 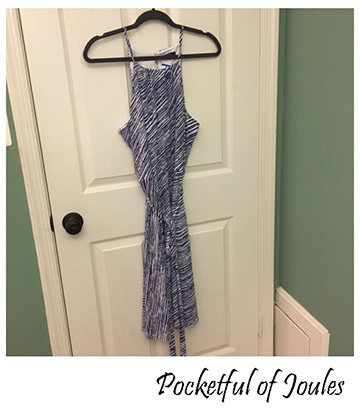 Dresses on their website run from about $190 – $250, and they appear to stick with classic silhouettes in fun prints. I tend to love a good black and white print, so this zebra one intrigued me. However, I posted a dressing room photo on my stories and it got very mixed reviews — with 44% voting to buy and 56% voting to pass. I ended up buying the dress and I think it will be fun to style for work. I can keep it simple with a black blazer, tights and booties. Or add in some color with a bright cardigan and maybe some colorful brooches. All in all, it was a $25 gamble, so we will see if it pays off!